Check out all upcoming classes here. 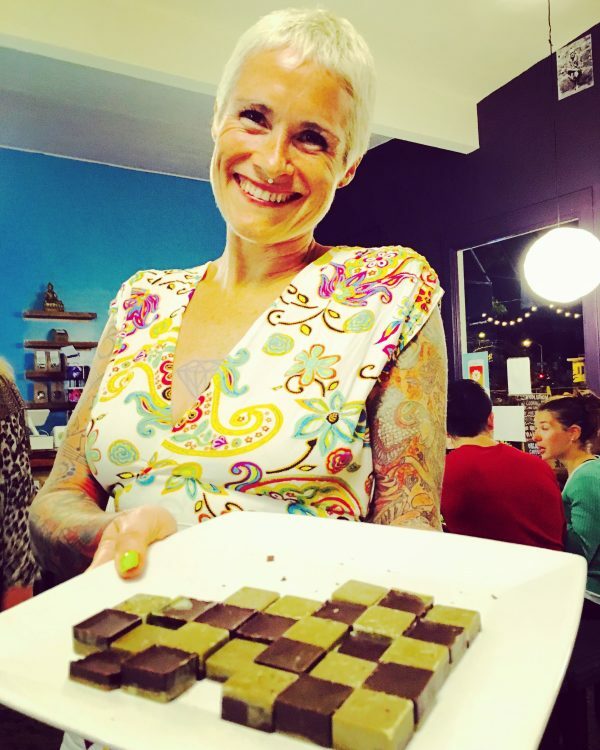 This weekend course is for people who are just beginning their raw food journey. I’ve been raw for nearly 25 years. I’ve been teaching for 14 years. Every challenge that people encounter in the early years of raw, I’ve been there, and I’ve helped many people who have been there. Every time-saving, energy-saving, money-saving tip that can be gleaned, I’ve learnt it and passed it along. When I started with raw foods, we were really working in the dark with very little guidance and support. I learnt to rely very strongly on my intuition to discover what was working and what wasn’t. This is the method I encourage you to follow: to listen to your body and tune into your heart, and find out for yourself how much bliss and vitality can be gained by following this path. In this two day course, I will share with you the fundamentals of raw food. My story. The ups and downs of how I got here, and some of the lessons I learned along the way. Very few people sustain a fully raw vegan diet for any period of time and so many people will tell you it can’t be done. I haven’t cooked my food or eaten animal products in a very long time, and I’ve raised my children this way as well. I will share with you what I believe are the crucial factors for successfully enjoying a raw vegan lifestyle. The scientific explanations for why raw foods are beneficial, to help you have a clearer understanding of what you are doing. This will help keep you focused and committed, as you have a clearer rational for eating this way. There isn’t a lot of science behind raw foods, unfortunately, but what we do have helps us understand why eating this way makes such a difference. The right foods to eat for our Northern European climate and our Western lifestyles. When we are living in a toxic society, surrounded by people eating a conventional diet, we have to be very careful to stay balanced and not be thrown out by all the stresses and struggles of everyday life. I will share with you the diet that works for me, and the diets that I observe working for the majority of people sustaining raw foods on a long-term basis. The foundational principles of cellular health. Health is about so much more than raw foods and one of the most common misconceptions people have is that by eating raw, they will automatically become healthy. Unfortunately, this is not the case, but we will look at the most important principles for true health and how to apply them. We will only have time to touch on this subject briefly: we go into it in full in the Raw Magic Advanced Course. We will make some basic raw food dishes. In my classes, I don’t just teach you a few of my favourite recipes. What I want to do is to teach you the language of raw food cuisine. Give you some basic grammar and vocabulary if you like! So you have a clearer idea of the ingredients we use, and how to include them, as well as going away with inspiration on how to make a million different dishes yourself at home. My cuisine is based around a busy domestic setting: the majority of my recipes can be made and enjoyed at the end of a hectic work day with the minimum of fuss and preparation – and yet they taste like something you would get in a gourmet restaurant in LA! On the first day, we will make the savoury dishes and on the second day we will make the desserts. We will serve a salad lunch on both days. Most people find that the food we prepare over the two days is an ample amount, but please feel free to bring snacks if you have a large appetite. We will have teas provided by Four Sigma Foods to start us off on both days, but please do bring extra water etc. Please arrive punctually, 10-15 mins before the class starts to enable you to have time to settle in properly. We will endeavour to finish punctually on both days: if you have to leave promptly at the end, please let Kate know in advance. Everyone attending the course for the full 10 hours gets a certificate and print outs with information and all the recipes. Please bring a notepad and pen, and drinks. That should be all the information you need! If you still have any questions, or if you would like to host Kate for a Beginners’ course, please email kate@rawliving.eu.